Neko Case can make a tambourine seem like a powerful tool. The clangy disc was her instrument of choice during her Wednesday night performance of “Bad Luck” on Conan, during which she and a team of back-up singers delivered a set so good, even the curmudgeon Conan O’Brien seemed incredibly enthused. That’s just the power of Neko Case and her tambourine (and possibly hers and Conan’s mutual donning of red hair). Watch her performance below. “Bad Luck” is from Case’s most recent album, Hell-On, which was released last Friday, June 1, what you might remember as an especially busy day for new music. Hell-On stood out from the masses, though, a tuneful charmer of an LP that doesn’t refrain from lyrical bite. You can stream it here and check out the Paste review right here. The singer is also doing a lengthy summer tour that will stretch into the fall. She’ll have support at some shows from Ray LaMontagne and Thao of the Get Down Stay Down at others. Spanning not only North America but also Europe, the tour will finish up in early November. Go here for all of Neko Case’s tour dates. 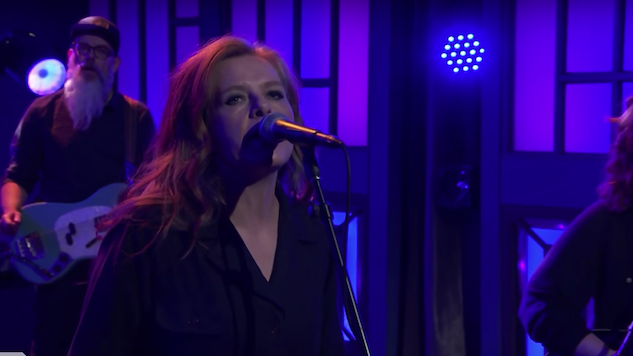 We ranked Neko Case’s best songs back in 2015, but the danceable “Bad Luck” sure would be in the running now. You can give that list a look right here.